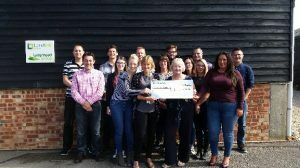 THE LANGMEAD CHARITY OF THE YEAR SCHEME was introduced at the beginning of 2017, and as a business this involves raising funds for charitable organisations. Two charities were chosen by the staff to receive support – OVER THE WALL and THE SUSSEX SNOWDROP TRUST, both linking with Langmead’s community engagement criteria, ie., local and/or sports-related. Fundraising for OVER THE WALL occurred between January and June with a variety of events being held …… Cake & Book Sale, Valentine’s Day games, a Mad March Quiz and in April, lunchtime games and an Easter Cake competition. June saw the FAMILY FUN DAY event take place. Plants, toys and sweets stalls + a BBQ and cricket/rounders matches were all enjoyed on a warm and sunny afternoon. The event raised £425. The total raised from the 6 month fundraising effort was £1,132.18.